Thank you for your prayers, and for your faithful support this past month. Spring is especially slow in arriving this year. The ocean ice broke on May 26th, but at the beginning of June, most of the rivers remained frozen, and the tundra was still half covered with snow. As soon as the rivers and streams clear, many of our listeners will head to isolated wilderness camps to hunt, fish and gather berries for winter, which will arrive all too soon. Every camp has a radio, and most of them remain tuned to KNOM, as their only contact with the outside world. Thank you again for making our work possible! TOWERING ISSUES: (left) KNOM engineer Les Brown inspects our 230-foot tower. In this photo, taken May 29th, you can see there was still plenty of snow! In late June, Les will supervise a complete antenna rebuild. 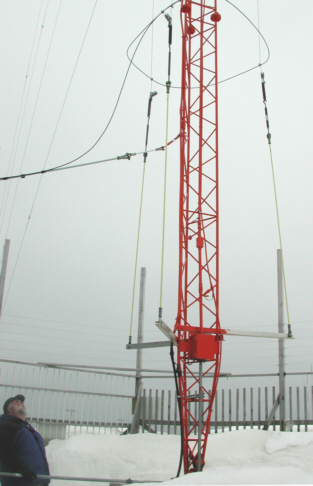 We will be replacing the three “unipole” wires which parallel the tower with six wires. That should greatly improve the antenna’s electrical characteristics, and reduce the voltage on it by about 50%. The work will take us off the air for about two days, but we expect to return with a signal that’s stronger and better than ever. Including material and labor, we expect the cost of this needed improvement to be approximately $11,000. INSPIRATIONAL SPOT: God doesn’t call the qualified. He qualifies the called. top “RUSSIAN” AROUND: In late May, KNOM hosted fourteen visiting Russians, both adults and students, who were in Nome to learn how to develop tourism in the remote, poverty-stricken Russian Far East. Guide and translator for the group was Vladimir Bwichkov, whom Tom and Florence Busch had befriended during their trips to Provideniya, USSR, back in 1989. FOOD FOR THOUGHT: Because all of our supplies are shipped by oceangoing barge or by air, prices in Nome are extremely high. According to the University of Alaska’s quarterly market basket survey, electric power in Nome costs about three times what it does in Portland, Oregon, and our food is 198% the cost of Portland’s. In the villages, prices are much higher. A bag of potato chips, for example, runs about $10.00. You can see why our listeners rely so heavily upon hunting, trapping and fishing to feed their families! 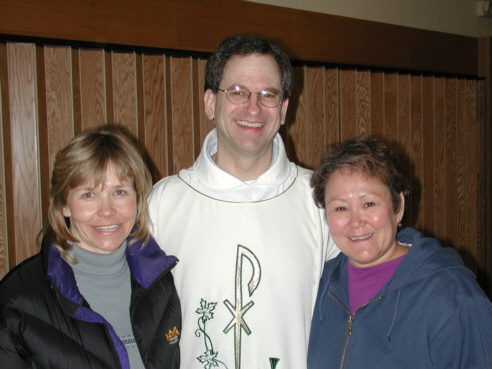 ALUMNI: (left) After Sunday Mass this past month, KNOM spiritual director Fr. Mark Hoelsken, SJ (KNOM volunteer engineer 1974-6 and 1977-78) shares a smile with Ann (Diffenbaugh) Blandford (KNOM volunteer support nurse 1977-78) and Florence Busch (KNOM volunteer secretary 1975-6). Please consider adding missions like KNOM to your will. May God greatly bless you for your help! KNOM is the oldest Catholic radio station in the United States, serving dozens of remote Eskimo and Indian villages with inspiration and education for almost thirty years -- thanks to you. INSPIRATIONAL SPOT: Lord, I offer you thanks for the gift of my family. Help us to work together in peace and harmony. Give us grace to accept each other for who we are. Protect us from harsh words and hurt feelings; lead us to encourage one another’s strengths and capabilities. May we always rejoice in each others’ successes, Lord. Bless our hearts with patience and kindness. INSPIRATIONAL SPOT: We could learn a lot from crayons. Some are sharp, some are pretty, some are worn down. Some have weird names, and all are of different colors. But they all live in the same box. top SUMMER “VOCATION”: (left) We warmly welcome the return of Deacon Ross Tozzi. 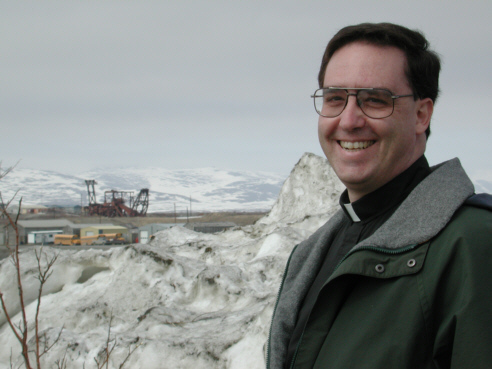 Every summer since, he’s helped close out KNOM’s books and audited our finances for the Diocese of Fairbanks. Following five years of study at Oregon’s Mount Angel Seminary, Ross will be ordained a priest in Nome on KNOM’s 30th anniversary, July 14th. We will broadcast the ordination Mass live. And -- he’s back on the air this month, deejaying the 2 to 4 PM shift. Welcome! WORDY: Program director Ric Schmidt calculates that KNOM dedicates approximately a million-and-a-half words a year to spots and public service announcements. Each year, we broadcast about 68,000 spots, half of them educational, half of them inspirational. That doesn’t count the 3-1/2 hours of news and 2 hours of weather we air every day, or any of our many interviews and public affairs programs. We are on the air 24 hours a day, working hard to make a positive difference in the lives of western Alaskans. GOODBYE: There were a few tears as we said farewell to volunteer Olin Fulmer, who returned to his home town of Gainesville, GA after a year of service to our mission. Please join us in praying for this wonderful young man, and wishing him success and happiness. INSPIRATIONAL SPOT: Don’t give God instructions. Just report for duty! top THIRTY YEARS AGO: June 1971, problems continued in the KNOM antenna tuning unit. That’s the box that electrically “matches” the transmitter to the antenna. Particularly troubling was the box’s frequent practice of destroying the meter which measures power. At the suggestion of consultant John H. Mullaney, volunteer chief engineer Tom Busch tried several different types of metering systems, and all of them overheated and burned. In hopes the problem would be solved, Fr. Jim Poole, SJ established July 14th for the station’s sign-on. Among fellow announcing volunteers Alex Hills, John Pfeifer, Don Pike and Leo Kehs, Tom was chosen to produce the station’s first program, an hour-long tape that was to include an introduction for the station, along with spoken greetings by Pope Paul VI, Bishop Robert Whelan, SJ, Alaska Governor Bill Egan, Senators Ted Stevens and Mike Gravel and other dignitaries. Rotary Club connections netted the station special taped greetings by Bob Hope and Bing Crosby, and President Richard M. Nixon had sent a congratulatory letter to be read. At a loss as to which taped greeting should be aired first, Tom began the show with the Carpenters’ recent song “We’ve Only Just Begun,” and followed it with the 70-second tape by the pope. 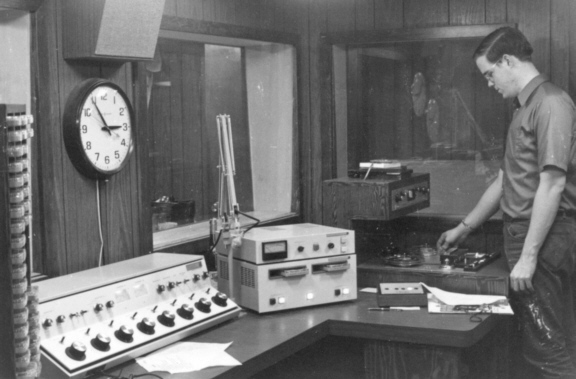 Narrated by the resonant voice of Leo Kehs, the completed tape sat on a shelf, awaiting airplay at 5:00 PM on July 14th, 1971. 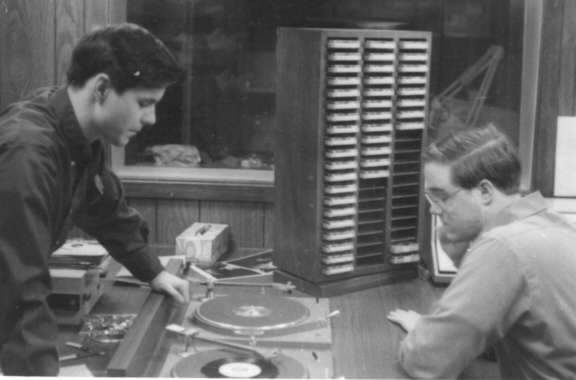 (Left) Volunteer John Pfeifer produces a spot in Studio A, using a Collins cartridge tape machine and a Scully reel-to-reel. In the weeks and months before sign-on, the crew produced about 200 educational and inspirational spots. (Left) Tom Busch, at left, and John Pfeifer ponder an engineering question in Studio A. Like Tom, John was a First Class Radiotelephone Engineer. CALLING ALL VOLUNTEERS: We have written all 190 former KNOM volunteers for whom we have addresses, inviting them to KNOM’s 30th anniversary. If you know a former volunteer who did not receive an invitation, please contact us with their current address and we’ll send one immediately. Everyone is joyously welcome for the festivities, which will begin with Mass on Friday, July 13th at 10 AM. At that Mass, we will pray for you, and we will especially remember the souls of the 17 former KNOM volunteers who have died over the years. The cost of air travel to Nome is so great right now that we expect only a dozen former volunteers and friends will attend in person. We hope that everyone will join us in spirit. LOTS OF “REIN”: Reindeer, that is. Hundreds of them are hoofing along the hills north of Nome, including many newborn calves, meandering among the bands of bare tundra and snow. They are a magnificent sight. Our mission has won dozens of major awards, but our most important honors are the loyalty of our listeners and your faith and support for our work. Thank you again, so very much. God bless you! INSPIRATIONAL SPOT: The Will of Our God and Father must be obeyed, even to our last breath. Perfection comes from changing our will, not to this world, but to Our Father’s world.